Goregeous, understory trees, ones that will draw the eye slowly up from your perennials to your towering shade trees. Ones to plant at the edge of your woodland or as a specimen in your lawn. 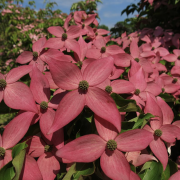 We have picked the best flowering varieties of dogwood for this years sale: 'Greensleeves', with masses of big white flower bracts that can linger for over a month; 'Wolf Eyes', a smaller form, with foliage edged in white that brightens a part shade setting all season; 'Scarlet Fire', the new Rutgers red bloomer featured here. We'll also have a shrubby redbud, 'Avondale', and one in tree form, 'Rising Sun', that has outrageously colorful foliage throughout summer after having a characteristic bloom in magenta in the spring. And then there are more natives: 'Autumn Brilliance' amelanchier and the difficult-to-find continus obovatus. Also, consider cornus 'Kintoki', which has put out lemon yellow blooms for over a month now and will bloom for several more weeks, or the exquisite 'Emerald Pagoda' styrax that will bloom in a month with hundreds of delicately dangling snowbells of flowers. Garden Design magazine has just posted an online article on the 12 best small trees on their site, featuring many of the trees we'll have at the sale (sorry, the jacaranda is not hardy here).